Just a few years ago, building real relationships with your clients online was a competitive advantage; now it is a basic requirement for doing business. This course gives you all the practical advice you need to transition from traditional marketing to powerful online engagement. It shows you how to use platforms such as Facebook, Twitter, Pinterest, Instagram, LinkedIn, Google+, and Foursquare to breathe new life into your brand. 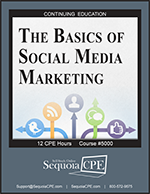 This course features insights from entrepreneurs, social media directors, community managers, bloggers, and other experts. It will show you how to pinpoint where your audience “lives” online, create relevant, engaging content, give your brand a unique voice and personality, build strong bonds with bloggers, identify and reward influencers, use targeting to engage more effectively, choose and use the best dashboards, and avoid pitfalls, with an emphasis on retail businesses.